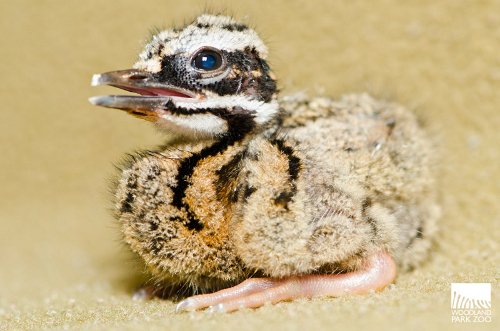 Top: Sunbittern chick at one day old. Photo by Ryan Hawk/Woodland Park Zoo. | Bottom: An adult sunbittern displays its eye-like feathers at Woodland Park Zoo. Photo by Dennis Dow/Woodland Park Zoo. 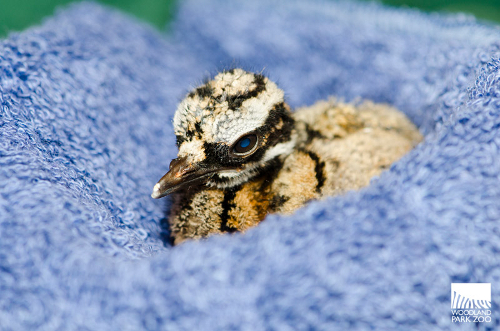 This little sunbittern hatched on November 20, the first sunbittern hatchling at Woodland Park Zoo in close to 15 years. At one day old, the chick is covered in fluffy down feathers not unlike the texture of the towel it sits on here. Adult feathers begin to grow in after 3 weeks. Photo by Ryan Hawk/Woodland Park Zoo. 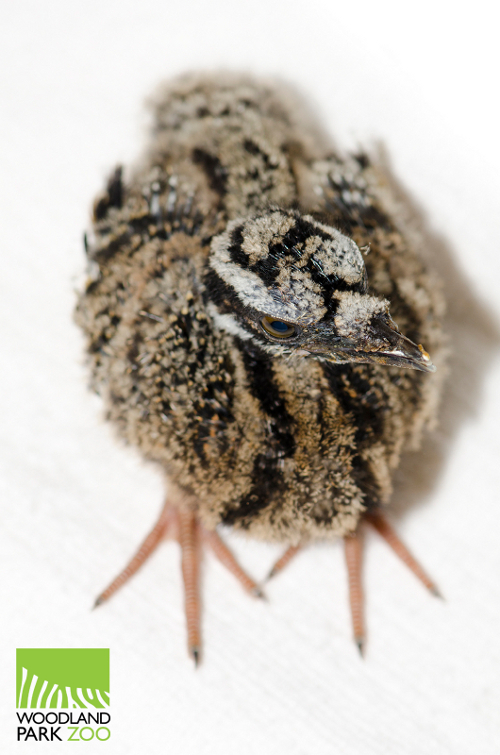 Sunbittern babies at zoos are fairly rare, with probably only around 10 new hatchings a year at best. The hatchings are carefully planned as part of the Species Survival Plan, a cooperative breeding program across accredited zoos nationwide to ensure genetic diversity and population health. 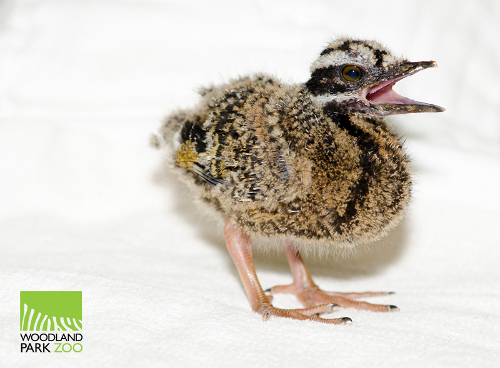 Seen here at 9-days-old, the characteristic long legs of the sunbittern—a forest floor walker with a slow and deliberate gait—are already growing in. Photo by Ryan Hawk/Woodland Park Zoo. 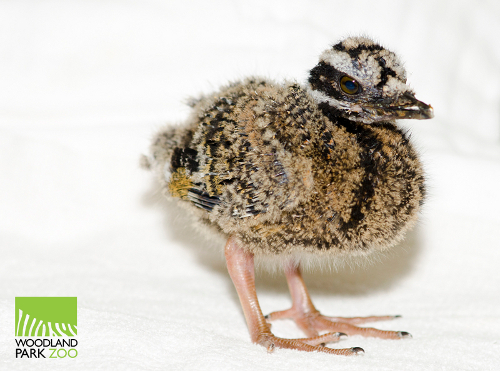 This chick is being hand reared by our dedicated keepers in a behind the scenes area at our Tropical Rain Forest exhibit to ensure its best chance for survival. The egg was artificially incubated to prevent any chance of it rolling out of the elevated nest the sunbitterns maintain. 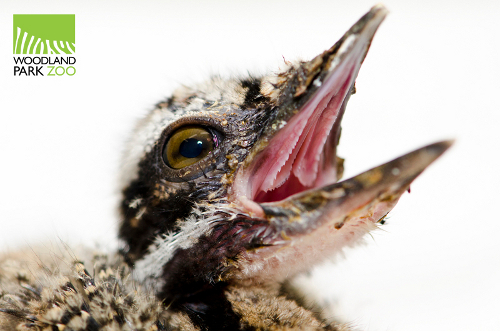 When it hatched, keepers stepped in to hand rear, starting out with 7 feedings a day every 2 hours. Weigh-in at one day old. Photo by Ryan Hawk/Woodland Park Zoo. 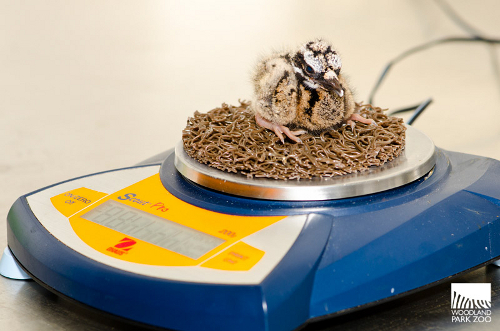 We regularly weigh the chick to keep track of its growth and make sure it is hitting all of its developmental benchmarks. At its latest weigh-in, it added up to about 3 ounces (90 grams). In the above photo, the chick is resting on a nesting structure with a craggy texture designed to make it easy for the bird to grip with its feet. And yes, it totally looks like a plate of worms. The sunbittern has large feet that spread the bird’s weight making it easier to walk on muddy rain forest terrain. Photo by Ryan Hawk/Woodland Park Zoo. 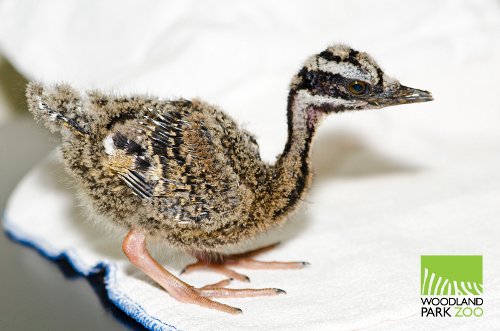 Seen here at 9 days old, the sunbittern’s characteristic long neck begins to distinguish itself. Photo by Ryan Hawk/Woodland Park Zoo. This chick will likely become part of the Species Survival Plan breeding program and will one day move out to be with a fitting mate that we’ll work on finding at another accredited zoo. The chick’s parents remain in the free-flight dome of our Tropical Rain Forest building where they are currently working on producing another egg or two. Chick at 9 days old. Photo by Ryan Hawk/Woodland Park Zoo. The call of the sunbittern is one of the recognizable sounds in the rain forest exhibit. This little chick isn’t very vocal so far, though it does hiss a bit when it’s surprised. Instinctually it fans its wings forward to make it appear larger than it actually is, just like a displaying adult would. What a treasure to watch elegance in the making. Great photos, kudo's to Ryan. What color are the sunbitten's eyes - Blue, Red, or Brown? Curious Girl - Adults have ruby-red eyes, and you can see the chick's eyes haven't quite developed that vibrant color yet. They look more yellowish brown at this young age.